Tales of rising women warriors -- notably women on the cusp of adulthood -- who must work against the resistance of a masculine environment, often tribal or clannish in nature, have arisen in many different forms through history. Spanning from Grecian mythology and the Chinese dynasties of centuries past to the latest animated works of Disney, these stories often hit certain archetypal points in their stories, yet the context of their individual cultures and the nuances of how the heroines tackle the challenges before them bestow specific, expressive meaning upon each one. Cinema has recently embraced a spotlight in terms of empowering female-centered films of this type, though, with the one-two punch of Disney's Moana and Wonder Woman over the past year, which will hopefully draw further attention to films that achieved similar, arguably more potent high points in prior years. 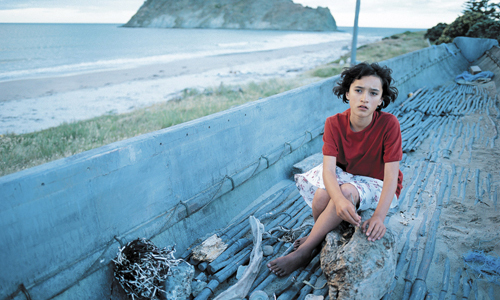 Whale Rider, a powerful movie about heritage, mysticism, and a girl harnessing her potential against the odds of a masculine setting, deserves to stand tall among these contemporary reexaminations. Niki Caro's coming-of-age saga certainly garnered attention when it was released in 2002, earning awards both for the film itself -- it won best feature accolades at the Independent Spirit Awards and Sundance Film Festival -- and for Keisha-Castle Hughes portrayal of Paikea, aka Pai. She's the only child of a chieftain's son (Cliff Curtis) from a Whangaran Maori tribe in New Zealand, and a direct descendant of the eponymous "Whale Rider" Paikea, indicating that she's technically next in the bloodline to lead her tribe. The problem, naturally, is that Pai was born a girl instead of a boy, which creates murkiness in terms of how she's to be raised and trained in the ways of leadership. As her grandfather, tradition-oriented elder Koro (Rawiri Paratene), establishes a cultural school for the other young men of the tribe, preparing them to be chieftains, Pai tries to learn as much as she can on her own accord and assert herself as equally as capable as her male contemporaries, while also dealing with the absence of her estranged, traveling father. Whale Rider quickly and passionately immerses the audience in the cultural dynamics of the tribespeople, asserting the significance of preserving legacy and of the necessities for male offspring in terms of hierarchal leadership. This occurs in the intimacy of a hospital room, though, surrounding the birth of Paikea and the melancholy circumstances that lead to her being an only child, driven by firm yet comprehensible conversations that pit the elders' concerns of their lineage against the real-world emotional challenges of her place amongst the tribe. While these are themes well explored in other stories, Caro's screenplay -- an adaptation of Witi Ihimaera's novel of the same name -- smartly navigates the disappointment, the chastisement, and the begrudging acceptance with a lack of expectation and certainty over what'll come of this. And that's just within the first, introductory scene, but it's a property that flows along with the rest of the film, the burden on the shoulders of the young girl whom soon emerges on the screen coasting on a bicycle. As Paikea, Keisha Castle-Hughes projects the promising attributes of an admirable would-be leader, showing initiative toward the Maori rituals without being provoked and leading ceremonies with her confident poise. There's a lot of emotional intelligence within Pai, which can be surprising upon her reactions to seeing her father after a long absence and to her grandfather's changing attitude toward her. Through Castle-Hughes' commanding eyes and heartening body language, there's no doubting the young girl's potential to transform into the kind of leader her people might need in the modern era, whose enthusiasm and respect for the culture comes from something voluntary and deeper than the tribes' desperation to persevere. Unlike other stories featuring reluctant young leaders who must "come of age" to accept and fully appreciate their role, Pai embraces her birthright while also waging a mini-war with the elders -- her grandfather -- to assert her worthiness, and it's only through Castle-Hughes' layered portrayal of her dedication that those cultural and emotional nuances are plainly visible. 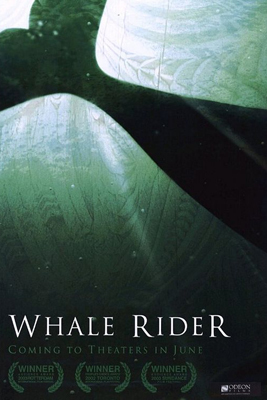 Much of Whale Rider ebbs and flows with the importance of Pai's innate connection to her ancestors, but there's more going on in her tale than mere acknowledgement of her lineage, hinged on the mysticism of generational prophecy and the depths of her people's connection to the sea. Like every other aspect of Niki Caro's film, this otherworldly component is handled with restraint and surprising impact, first emerging in a simple scene of Pai gazing upon the blue expanses of her home and feeling an unexplainable, important lure preventing her from venturing far from her tribespeople. The essence of Maori lifeforces looming in their communal hall and the significance placed upon the retrieval of a tribal necklace provide an undercurrent of spirituality throughout, handled by director Caro in a fashion that feels ever-present yet doesn't intrude upon the story on a respectably grounded level. While Pai secretly trains in speechcraft, ceremonial posturing, and wielding a wooden staff as her tribal brothers stumble over the same tasks, the omnipresence of ancestral fate and responsibility palpably stirs around her. Absorbed on their own, the elements that make up Whale Rider form into a tender, complex portrayal of cultural obligation and coming-of-age resilience, but the magic of Niki Caro's film only truly rises to the surface once they all rush together into its breathtaking conclusion. Because of writer/director Caro's clever navigation -- and subversion -- of Pai's interactions with her people and their heritage, certain expectations about where her heroic journey's headed veer into uncertain territory, despite being a family-oriented film with seemingly clear objectives and tonal paths. With splendid, unpretentious beachside cinematography juxtaposed with a deeply expressive tribal display occurring indoors, featuring a tear-eyed Keisha Castle-Hughes standing front-and-center in ritual garb, the story's brave finale mixes personal catharsis with smartly-handled spiritualism and poetic imagery into something even more profound. 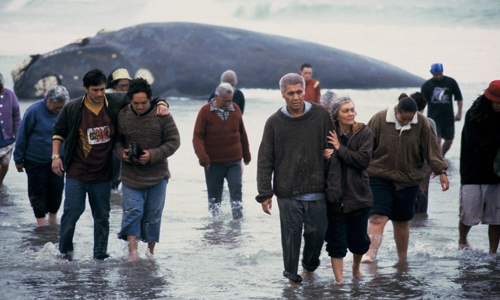 Whale Rider's a beautifully meaningful piece of cinema beforehand, but it becomes a masterclass by its end because of how far Paikea's willing to go.